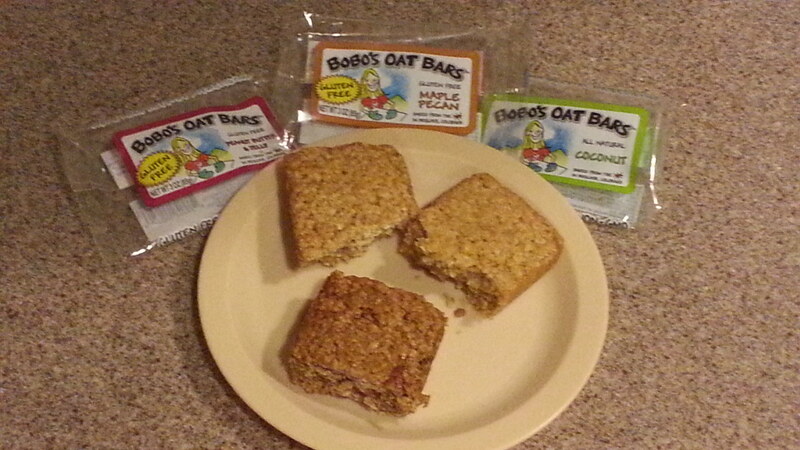 I am going to say that I love when I see a company I like have success – this is the case with Bobo’s Oat Bars. Recently Bobo’s underwent a change when they added New Flavors, A New Look And A New Name. Instead of being known as Bobo’s Oat Bars they are now known as Bobo’s and have added Chocolate Chip, Coconut Almond Chocolate Chip, Almond Butter, Banana Chocolate Chip, and the seasonal Gingerbread flavors. This entry was posted in Food and Drink Products, Giveaways, Gluten-Free and tagged giveaway, giveaways, Gluten free, oat bars, Review on October 8, 2016 by Jennifer. It is not secret that as a blogger at times my time is limited, and I am on my way somewhere. I am always looking for easy ways to get the nutrients I need with a easy on the go snack. Last year I had the chance to try Bobo’s Oat Bars and as I said then I wish I had these when I was a high school student and always running late. Bobo’s Oat Bars are are mini loaves of compressed oats and are are available now available in Bobo’s Bites! These Bites come in 6 flavors including Original, Apple Pie, Peanut Butter & Jelly, Lemon Poppyseed, Maple Pecan and Coconut. This entry was posted in Food and Drink Products, Giveaways, Gluten-Free and tagged giveaways, Gluten free, oat bars, Review on July 21, 2016 by Jennifer. Confession time again! Despite my best intentions I usually run about 5-10 minutes late. This is usually due to wanting either a snack or drink to go, and this has been happening since I was young. I wish 30 years ago on the cold mornings I was running late, that there was a breakfast snack like Bobo’s Oat Bars. Bobo’s Oat Bars are mini loaves of compressed oats. Bobo’s Oat Bars are available in 10 regular flavors including original flavor, cinnamon raisin, peanut butter, cranberry orange, coconut, chocolate, almond, banana, strawberry and apricot. Bobo’s also makes 6 gluten-free flavors including peach, maple pecan, lemon poppy-seed, chocolate almond, apple pie and peanut butter/raspberry jelly. This entry was posted in Food and Drink Products, Giveaways, Gluten-Free, Reviews and tagged Gluten free, oat bars, Review on July 20, 2015 by Jennifer.